I have this necklace that I bought myself a few months ago. We were nearing an anniversary of one of my miscarriages, which usually makes me just a little emotional. I had been looking for some sort of memento for my friend who had suffered through her first miscarriage not long before. I came across this little pendant and fell in love! 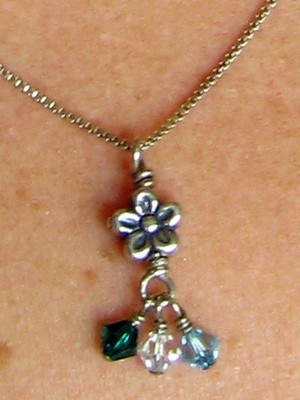 It has an actual “forget-me-not” flower made into silver, with room for multiple birthstones to hang from it… mine has 3. For months now, this necklace has served as a quiet memorial for me to remember the babies I never got to hold. But recently, it’s come to mean something more. Jolene told me that one of the harder parts of dealing with her miscarriage was thinking about the fact that she’ll never see that baby grow up. It truly gave me a new appreciation for the 3 sweet little girls I have running around my house today. Before a few months ago, I had never entertained the thought of what I was missing out on when those 3 miscarried pregnancies ended so abruptly. After a few moments of reflection on this topic, I was in tears. But it was not the ideas of “I will never (this side of Heaven) get to see those babies smile” or “we won’t get to see them grow into adulthood” but rather “those babies will never wake me up in the middle of the night with a bad dream. Those 3 babies will never spill their drink all over my freshly-mopped floor. I will never have the opportunity to get tired of wiping their snotty noses or answering the call of ‘Mooooooom! I’m doooooooone!’ from the bathroom.” How I would love to do any one of those things for any one of my Heaven babies. Maybe you’re not like me. For your own sake, I do hope you’re not! But I can get a little obsessive when it comes to projects. Once I’m rolling on something, it is nearly painful to be interrupted! The good news is that I’m finding this to be less and less true of me lately. Somehow, the realization of the interruptions I will never get to deal with have made me more grateful for the ones I face daily! Don’t get me wrong… I’m still a long ways from where I want to be in my mothering journey. But I feel as though this has been a revelation in my life. It has been that little nudge that encourages me to take of the dish gloves, and stoop down to kiss an owie. Or to put dinner preparations on hold for a few minutes to hold whichever girl is asking for attention. Sometimes it means laying awake in bed with a feverish or scared child, whispering something soothing instead of dealing with it and getting back to sleep as soon as I can. These days are flying by so quickly! My baby will be 2 in just a couple months and currently attempting to potty-train herself. Wasn’t it just a few days ago that I learned we were expecting our first baby?? These are the days that I remind myself to enjoy each season. Some seasons feel longer than others. Like the “let’s wipe our spaghetti hands clean in our freshly washed hair” season. But then I turn around and that one is over, too! I am glad I have this “forget-me-not” to wear around my neck now. Something tangible to remind me that every opportunity I get to be mom to these girls is a precious one that I might not have had, and will never have again! Thank you, God, for interruptions! I have some very dear people in my world who have been longing for a baby. Some for just a few months, others for years. Some have just started the process of figuring out what’s going on with their systems, and other have been doing everything they can think of (and/or afford) for many many months! I just want you to know I understand! I know what it feels like to cry every month when you realize you’re still not pregnant. Or wonder if you’ll ever get to see a positive sign on that stupid pregnancy test. I understand how it feels to be mad when you hear a pregnant person whining about morning sickness or backpain or heartburn! The furthest emotion from your heart at that point is sympathy! I know the heartache of miscarriage after miscarriage and wondering if you’ll ever get to hold your own healthy baby. I understand just wanting to be mad at *someone* or the urge to bite a person’s head off when they try to help or encourage you. I’m going to try my hardest to not make this sound like an info-mercial. 🙂 But I really want to share the one single item that I think turned this issue around for me. Before Cloe, I worked with a specialist to try and figure out what was going on with me. We finally got pregnant, only to miscarry at 13 weeks. Then came Cloe. Then 2 more confirmed miscarriages, and 1 more suspected. Then I had 3 different people (who don’t know eachother from Adam) tell me about MannaTech. Turns out, they are a Christian organization and have a special program for missionaries! Because of that, I was able to start taking this stuff. Within 6 weeks of the start date, I was having regular cycles and almost immediately got pregnant with Gabi! Then Brennah! Not a single miscarriage in over 3 years. Of course I believe God’s grace and mercy was involved! But I really think if it weren’t for “Plus”, the endocrine system support vitamin, I’d still be struggling with infertility.